Redwood in shadow. Hasselblad 500C/M, 80mm Planar, Tri-X, Diafine. The Bay area of northern California is one of my favorite places to visit. The parks are awe-inspiring and easily accessible. The diversity of flora and fauna is wonderful to take in, especially with a child along for the hike. In fact, my son makes most of our hiking decisions, based on which birds of prey he wants to see. On this occasion, we left the Temescal farmers’ market in Oakland and debated several destinations. A quick glance through our East Bay Regional Parks brochures, and I realized there was a park we hadn’t visited only a 15-minute drive away. 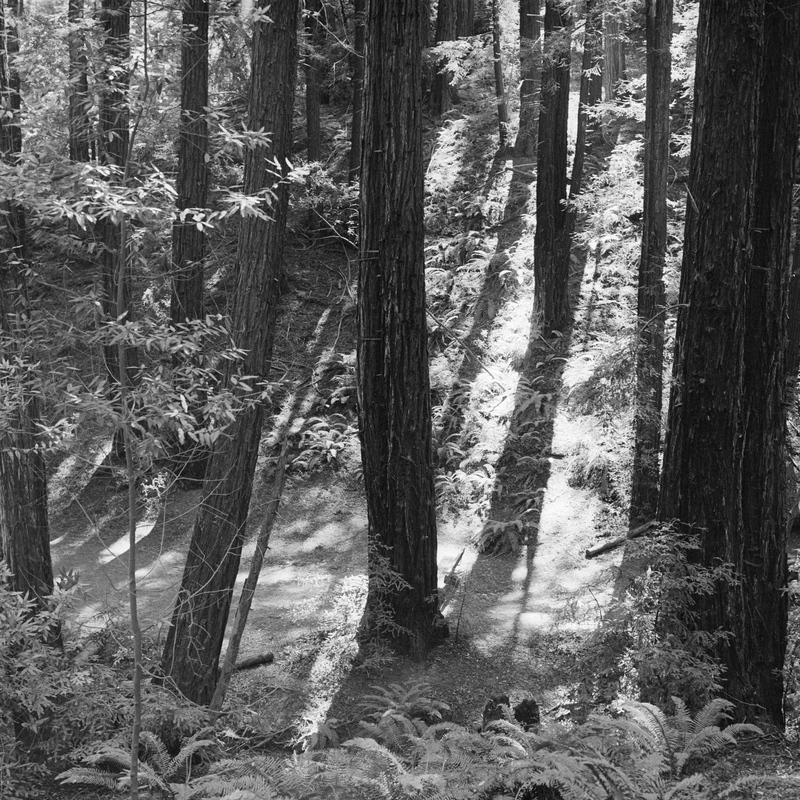 Redwood Regional Park. Indeed, we got there quickly enough, but Google Maps had a different idea of where I wanted to be, so we ended up at a picnic area with a playground for about 45 minutes. That’s the beauty of this parks system—you can go to a single park and get hiking, deep woods, playgrounds, something for everyone. Some minutes after that detour, we made it to the Skyline Gate staging area. To call a Hasselblad 500C/M a traveling camera, or even a hiking camera, is a stretch, though to its credit, the 80mm Planar is compact. But medium format and larger is really necessary to capture these scenes (though I must credit the Yashica Electro GSN/GTN for some of my personal favorite hiking photos). Metering was difficult. I had my small Sekonic L-308S and the meter in the PME51 prism finder on the Hasselblad. The sunlight was bright, but we were deep into a redwood forest. The range of light is challenging. I attempted to meter for middle ground. In the case of the first photo, above, it was the ground in light shadow. I shot the film at EI1000, knowing that I would be developing it in Diafine. Diafine can help control the highlights, so I was effectively compressing the range of light. 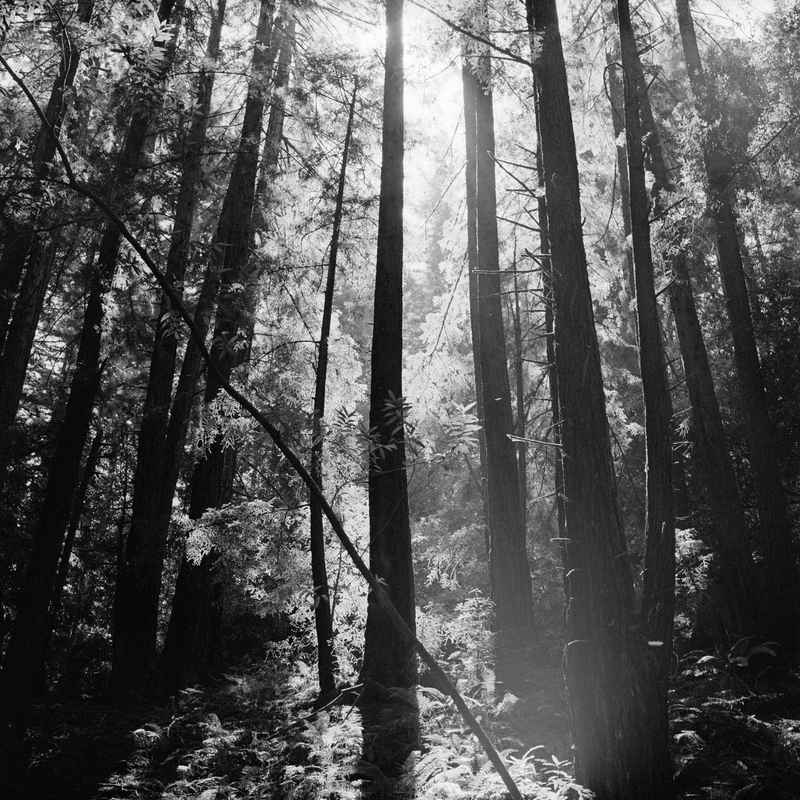 Redwoods in silhouette. Hasselblad 500C/M, 80mm Planar, Tri-X, Diafine. The second photograph is more stylized in that I simply couldn’t bring all of that range of light and shadow into the silver. Highlights are blown, and some shadow goes to black. But it still evokes the scene I witnessed—especially in details like the highlights on the short, horizontal branches on the tree just right of center (you may have to click the image to see a larger version). An interesting rock formation. Hasselblad 500C/M, 80mm Planar, Tri-X, Diafine. The third photograph was taken in indirect sunlight. Even with the high speed at which I rated the film and the available light, I had to shoot with a relatively shallow depth of field, which explains the softness at the bottom of the frame. 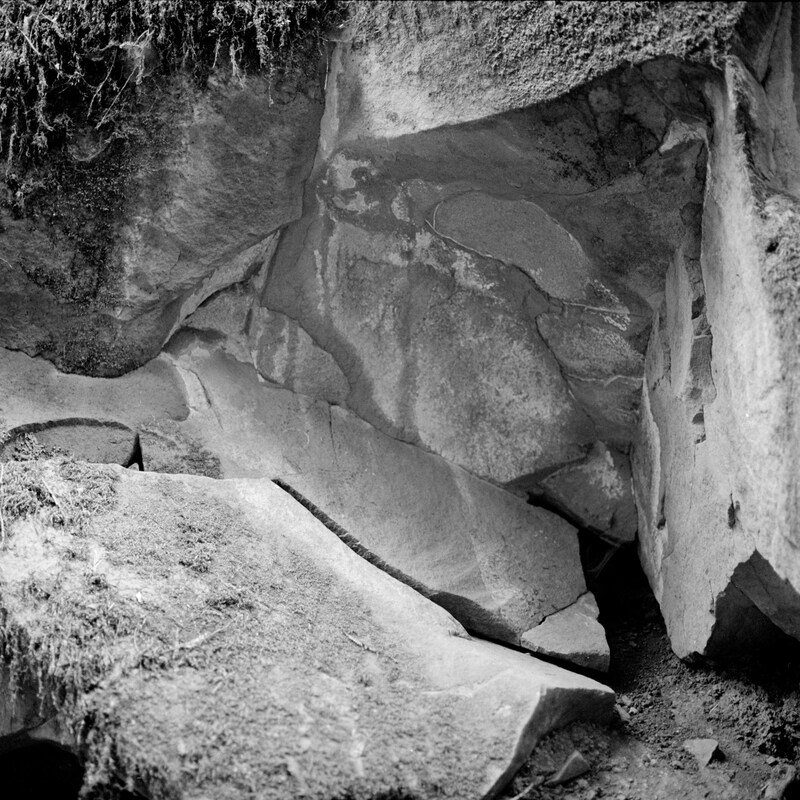 But the medium format film kindly offers up lovely details in the bits of vegetation that dot this gorgeously twisted stone. We are just southeast of the Sibley Volcanic Regional Preserve, so rock formations like this are not surprising. I shot a lot of rolls while out there, and I’m still developing them, but I couldn’t wait to start sharing. Hopefully I’ll be able to wet print some of them. I’m especially excited to try that shot at the top. Wonderful shots I love anything with trees in and would love to visit that woodland.